If you have not visited our Greytdogs Store, you are in for a pleasant surprise! We have completely “remodeled” our store and have added a huge inventory of brand new items! 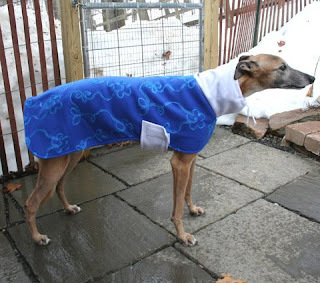 We have an extensive line of double fleece coats. Some of these coats are one of a kind, but many can be made to order if you supply us with the measurements. We also have greyhound accent pillows in three designs. Also new is a full line of “comfort” coats. These light weight coats (or jackets) are great for just about any dog. Another new item that we are excited about is our running greyhound tag collars. 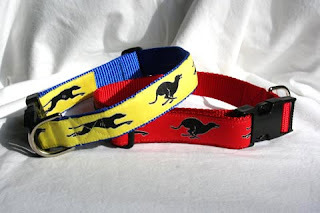 These collars are great in the house where a Martingale is not needed. Your hound can still have a decorative collar to wear, but if he/she gets lost, the collar with the tags will help get him/her home. All of our merchandise is reasonably priced. ALL of the money we make in our Greytdogs Store goes directely to helping our hounds and particularly it helps support our Craiger’s List program. Check us out! Just click on the title of this post.